The freighter traffic was getting heavy as we made our way north though Selat Riau, the wide channel that works it way towards Singapore. Our guide book mentioned an anchorage that sounded promising and we were just about to pull in when a very dark thunderhead threatened to turn loose on us. The anchorage turned out to be awful so we headed back south and found a very secure spot just to the east of Raja Island. After a very comfortable night, we got underway the next morning for what was to be our final leg with Sail Indonesia, a luxury resort on the north side of Bintan Island. 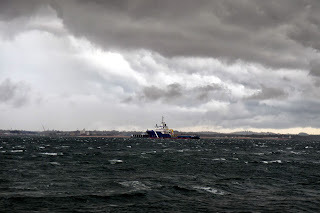 As we were dodging the massive freighters that were anchored, another very dark thunderstorm was forming to the west and soon the wind was up to the low 30s. 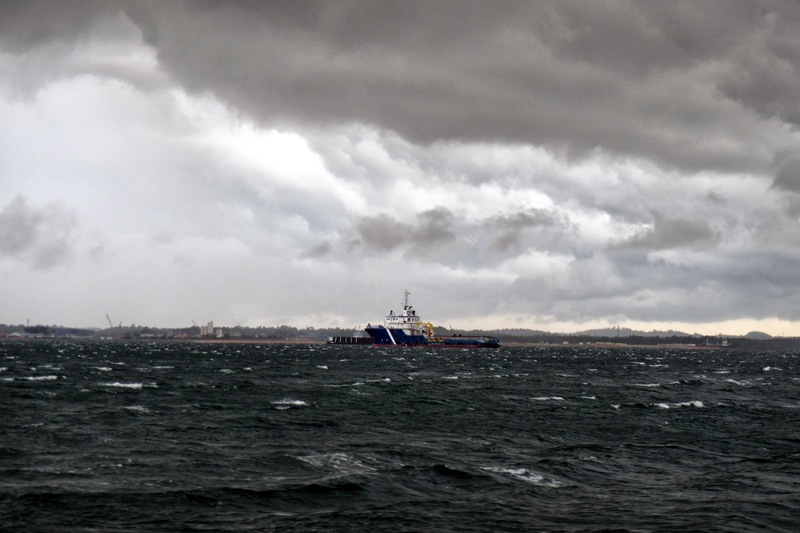 It didn’t take long for a decent-sized swell to develop but the rain associated with the storm was relatively mild. The route I had plotted on the chart plotter took us over an area that had about 35 feet of water, more than enough for Rutea’s 6’6” draft but still relatively shallow compared to the water surrounding us. I wasn’t worried about it but I still kept a watchful eye on the depth sounder. What was more of a concern was the enormous amounts of trash in the water. The wind had dropped to about 10 knots and with just the genoa out, we put the engine on to keep our speed up. With a sudden jarring and loud banging from the hull, Rutea almost came to a complete stop. “We’ve run aground,” I shouted and shifted the engine into neutral but a quick check of the depth sounder said we were still had 35 feet of water under the keel. Perhaps we had just picked up something on the prop so I tried reverse but the noise that came from the engine/transmission indicated that something was seriously wrong. I tried to do a logical diagnosis of the problem and I became suspicious of the transmission. A quick inspection didn’t reveal anything obvious or conclusive. Ruthie suggested I look over the transom and see if we were trailing anything. The answer was very plain and very troubling. Sticking out about four feet from under Rutea’s hull and transom were four large timbers, each one measuring about 6” by 8”. The ends of the timbers were rounded from wear but the wood was still very sound. I could see a threaded rod, measuring about ¾” in diameter that was keeping the timbers together. What I couldn’t see was the end of the timbers that were still under the boat. We furled the genoa and threw a long polypropylene line in the water, something for me to hang onto when I was in the water. There was enough wind that even with the sails furled, Rutea was still moving at about 1 knot per hour and can’t I swim that fast. Once in the water with my facemask on, I could see the whole story. 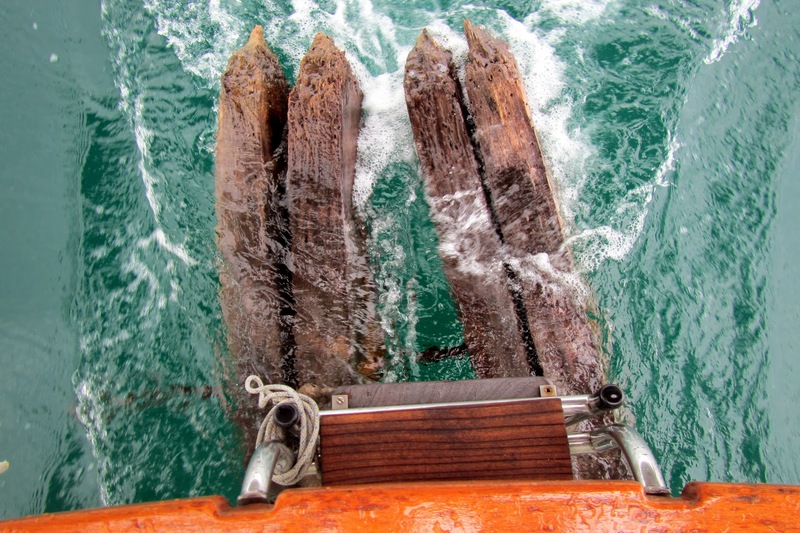 Four heavy timbers, probably twelve feet long each, held together with three four-foot lengths of threaded rod, were on either side of Rutea’s skeg and rudder, just inches away from her prop. The seas were still rough enough that it would have been difficult if not impossible to remove the timbers where we were. 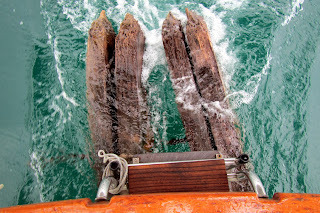 The wood still had enough buoyancy that I could stand on them and my weight didn’t make them sink appreciably. I decided that all we could do for the moment was sail into the anchorage, which was only a couple of miles away. Running the engine was out of the question as it would have been far too easy for one of the timbers to shift right into the prop, easily ruining it. We sailed into the anchorage, dropped the hook and I was in the water with a hacksaw a few minutes later. It took about 15 minutes to saw through the threaded rod, one pair of timbers drifting away easily while the other pair was applying enough pressure on the rod that I still couldn’t free it. I started to think about rigging blocks and tackle to attach to the whole mess when a final effort got the timbers free. The whole episode now just seems like a bad dream. The only damage I could see was where the threaded rod had worn away the gel coat and some of the fiberglass on the leading edge of the skeg, a repair that’s not too difficult to make once the boat is out of the water. What I still can’t understand is how the timbers, two on each side, got to straddle the skeg and rudder. If the whole mess had been floating, it would have struck the boat just below the waterline. Why didn’t the timbers straddle the keel? How did they get past the keel in the first place? Alls well that ends well but this could have been a disaster. Yikes, Neal. Sounds like more excitement than the average sailor needs. You came out well though. Well done. Happy to hear you made it through this ordeal with only a scrape and an amazing tale. Might not have believed it without the pictures. Good for you Ruthie for pointing him in the right direction!